So after five years my sister came to visit me. And she had a sewing wish - get some new tango dancing clothes. I thought, hmmm, what an interesting challenge, let's try that. We started with sharing some ideas and researching on Pinterest at least to agree on some basic principles. It has soon become clear that my sister wanted comfy, body-hugging clothes, therefore knits. As I do not have a stock f knits at home, we did some research and fortunately found a few nice stable knits at bennytex.fr. 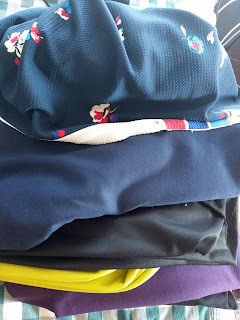 I placed the order and two days later a huge bag of fabric arrived. Of course, I took the opportunity to get some knits for myself as well, which will hopefully get sewn later this year (hopefully, because my stash is just increasing this year, so I should make some more effort on that). I bought some ponte di roma, which had little strecth but is very soft and had the most incredible colours, then some more cotton stretch. In addition, my sister chose some kind of blue flowery polyester, which was really different from all the others but suits her very well and it will be very comfy for dancing as well. As for patterns, I used Nettie dress from Closet case patterns as a basis and it worked really magic and then some Burda ones. So that you know, the few next blogposts will be about the new tango wardrobe. Let's start with this blue flower dress. As already said, the fabric is not my favourite, but the end result is very cute and looks great on my sister, so a big win. I used the Nettie dress with the very deep backline and a deep neckline. Apart from that, I kept it simple and I just love this dress. The second dress is a mix of the Nettie dress pattern and Burda 120/05-2013 for the shirring in the back. This time I omitted the sleeves and used some blue ponte di roma. The dress is also very cute. My sister was originally worried about the shirring, but I convinced her to try it and see and when she saw the final dress, she liked it as well. Both dresses are gorgeous, but I love the one with the shirring - that's a great idea.